I'm running up-to-date Ubuntu Karmic. This bug started occurring a few days ago. "Error saving note data. An error occurred while saving your notes. Please check that you have sufficient disk space...". See attached screenshot. I have plenty of free disk space so that shouldn't be a problem. A new error message pops up every minute or so, essentially making tomboy impossible to use. but the note currently open (and causing the problem described above) will only have two two backup versions, one ending with "~" and on ending with ".tmp", e.g. Over the past several days a few notes have been lost, simply disappeared from my system. Have you checked the permissions on ~/.local/share/tomboy and the *.note files that it contains? It sounds like your permissions are messed up. Very strange. Is it possible that you have two Tomboy processes running? The problem has come back after being absent for about two weeks. 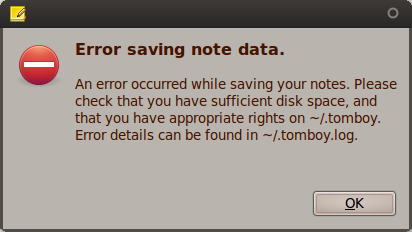 I get the same error pop-up as mentioned above saying that I have run out of disc space or that I don't have sufficient rights to ~/.tomboy. Message reappears every minute or so. Thankful for any further advice you may have. The only thing I can think of that may have triggered this bug again, is that I recently rebooted (about an hour before the pop-ups started appearing). I rarely reboot. This bug occurs for me petty much every time I try to use Tomboy now. I'm thinking I have to try and reinitialize Tomboy on my system, so that I can access all my notes, without risk of loosing them (due to the deletion issue, see above). I tried deleting .config/tomboy and restarting tomboy, but that didn't help. The bug keeps occurring. What else could I do to make my tomboy operate as in a fresh account? I'm just throwing this out there as an idea: My home is 98% full. Could that be the reason why tomboy keeps warning me about low disc space? If so, that doesn't make sense since those 2% free comprise about 1.5 GB. Tomboy doesn't actually check to see if you're low on disk space. It just assumes that if it can't write to disk, then a likely culprit could be running out of disk space. If you could post a complete log, that might be helpful. I just found a bug in Tomboy similar to this, and if I saw a complete tomboy log showing your error, it might help me track down your problem if it's similar to the one I just found. know how to trigger the bug. I'll post a log as soon as it reappears. > similar to the one I just found. > I'm running up-to-date Ubuntu Karmic. This bug started occurring a few days ago. > "Error saving note data. An error occurred while saving your notes. Please check that you have sufficient disk space...". See attached screenshot. > I have plenty of free disk space so that shouldn't be a problem. A new error message pops up every minute or so, essentially making tomboy impossible to use. > but the note currently open (and causing the problem described above) will only have two two backup versions, one ending with "~" and on ending with ".tmp", e.g. > Over the past several days a few notes have been lost, simply disappeared from my system. The bug has reappeard after some time of absense. I attach the complete error log, although it doesn't appear to contain any new information compared to what I included in my original post. I will soon upgrade to Lucid Lynx, and I am hoping these problems will disappear after upgrade (I will do a clean install and import my old notes). I will post again if similar problems occur. You might want to try upgrading to Tomboy 1.2.1, which should be available for Lucid. I fixed a bug like this in that release, and I'd like to know if the fix makes your problem go away. Sorry, I have already upgraded to Lucid. Fresh install. Tomboy works fine. > like to know if the fix makes your problem go away. This bug has not been present since Karmic, but it reappeared as soon as I upgraded to Oneiric. I am now getting the "Error saving note data..." pop-up on a daily basis. I also have another Tomboy bug: https://bugs.launchpad.net/ubuntu/+source/tomboy/+bug/890837. I am mentioning it since perhaps they could be related. I have also lost a note, only one though. But it was a very important one :-( I'm also getting the constant errors writing to disk after upgrading to Oeneric from Natty. I'm having the same problem now. Oneiric. Lots of disk space, permissions look fine. Tomboy log attached. Suggestions? I am having the same problem, I have plenty of disk space. Attached a log file, looks a lot like what has already been posted. Mostly just a bump post. Tomboy has been crashing constantly, I'm going to have to install something else until it is fixed. Please someone find why this bug is happening! I've been having similar crashes - just today it has happened three times. I had a similar problem after the disk was full. Once the HD was full I started getting this message that Tomboy couldn't save the the note. I cleaned up some disk space and I keep getting the error message. Btw, I think I workarounded the problem by deleting the .tmp in ~/.local/share/tomboy. It seems tomboy is saving notes correctly now. I just had the same problem. I did have my disk fill with .xsession-errors up to 100%. I was getting this message over and over again. I just moved all the .tmp files out of the directory, and it seems to work fine now. Some problem here (harddisk full, after regaining space, unable to save), but a slightly different error. [ERROR 17:22:54.022] Exception while saving note: System.IO.IOException: Invalid handle to path "/home/user/.local/share/tomboy/fb094aa4-6bbe-405b-9e60-c87ee6343d2b.note.tmp"